Over the past few weeks, I’ve begun carpooling to and from the office with a couple of my co-workers. We meet in Miramar, work out, and then take turns driving to work each day. To be quite frank, it’s awesome. I save an entire tank of gas each month, not to mention some sanity by avoiding a daily commute through Miami’s treacherous, perpetually under construction highways. But one of the best parts of my new shortened commute is that I know I have the opportunity to connect and get to know my coworkers a bit better. We spend most of the drive gabbing on about weekend plans, inside jokes, or the time we spent at home the evening before. During our conversations, I’ve learned one interesting fact about myself: I watch too much television. Now don’t get me wrong, I don’t think that television has quite taken over my life. I still manage to eat, sleep, exercise, and do my job properly, but I do watch a lot of TV. Some of my favorite shows include Game of Thrones, The Voice, Mad Men, Boardwalk Empire, Arrested Development, Dexter, It’s Always Sunny in Philadelphia, Devious Maids (I know – guilty pleasure, I’m sorry), Family Guy, and of course AMC’s Breaking Bad. The list really goes on, but I think you get the picture. I’m an all-around media lover – from books and magazines to music and TV, I just can’t get enough. If you’re a fan of Breaking Bad as well, then you’ve probably cleared your Sunday night schedule to make room for the season premier of the final 8 episodes. With this in mind, I’ve decided to devote this week’s article to Breaking Bad and the lessons it has taught me about marketing. Before I delve into this article – spoiler alert! I’ve watched every episode aired, so I may let a few plot points slip here and there. If you aren’t caught up on your episodes – you’ve been warned! Originally aired in January 2008, Breaking Bad centers around Walter White, a high school chemistry teacher who works part-time at a car wash. After being diagnosed with inoperable lung cancer, White turns to a life of crime by using his knowledge of chemistry to produce and sell methamphetamines. In the beginning, White’s main goal is to provide financial stability for his family before he dies. However, he soon finds himself deeper and deeper in the drug game, leading to danger for himself and those around him. As I mentioned earlier, my television hit list includes a wide variety of genres and networks. Game of Thrones and Boardwalk Empire on HBO, for example, star brilliant actors, are well written and beautifully directed. However, I’m somewhat less impressed with the work when I find out that their season budgets range from $50-60 Million. Breaking Bad, on the other hand, also has great acting, writing, and directing – and they do it with around half the budget of HBO. I know that $25 Million is still nothing to sneeze at, but it certainly puts things in perspective. So what does this teach us? It teaches us that great content does not require an enormous budget. At its core, great content requires creativity. What is more creative than a chemistry teacher who becomes a methamphetamine manufacturer and distributer? Great content, essential to successful marketing, all starts with a great, unique concept and a plan to execute it. In August 2011, AMC announced that Breaking Bad had been renewed for its fifth and final season. It would be a total of 16 episodes split into 2 parts, broadcast over the course of two years. The first eight ran from July 15 to September 2, 2012, and the second half will premier this Sunday. By cutting the season in half, AMC created anticipation among fans. The practice of creating anticipation is not new to marketing in the least. Apple uses anticipation when they announce a new product and its release date; Walt Disney Pictures does it when they show a preview for a new feature film. In addition, by elongating the season, AMC has given potential viewers a chance to “catch up” on older episodes so they can join other fans in the final episodes. Here at Optimum7, we discuss authority quite a bit. We’ve mentioned the importance of authority online, with clients, and within your office. Authority can come from a variety of places – product reviews, testimonials, certifications, etc. Breaking Bad has won numerous awards, and been nominated many times. The show has won seven Primetime Emmy awards and three nominations for Outstanding Drama Series. Bryan Cranston has won a Primetime Emmy Award, a Saturn Award, and a Critics’ Choice Award. The list goes on and on, but the point is that because of their outstanding work they have earned quite a bit of recognition. With this recognition, Breaking Bad has become a television authority, which has led to more viewers. You don’t have to be a television show to gain authority. By producing quality content, a great service/product, a pleasant user experience, or outstanding customer service, your business can become an entity that your users/customers come to know, respect, trust, and revisit. Breaking Bad is all about risk. The most obvious risk is the main character’s second life as a drug lord. Another notable, and perhaps more important, risk comes from that of the show’s creator Vince Gilligan. Gilligan is of course talking about the main character here – Walter White – a protagonist who becomes an antagonist. Because of White’s increasingly unsympathetic attitude and dangerous decisions, the audience finds itself constantly wondering who to root for and why. This is practically unheard of on most television shows and films. Typically, the protagonist stays the protagonist, and that’s that. By allowing Walter to switch sides, Gilligan made a very risky decision that could have backfired. However, in its fifth season, Breaking Bad has over 389,000 followers on Twitter, won countless awards, been mentioned on several media outlets, and drew 2.8 million viewers for its last season premiere. If that isn’t an example of a big risk paying off, I don’t know what is. Breaking Bad isn’t for everyone. Gilligan is constantly putting his characters in stressful situations, often resulting in darkness and violence. Because of this, I can understand how on a Sunday evening when you are preparing yourself for the upcoming workweek, you may not want to turn on such an intense show. Despite this fact, Breaking Bad is still a hugely popular show. Why is this? Because it unapologetically embraces what it is. It is consistent on all fronts, and I have full appreciation for this. I absolutely cannot stand when a marketing campaign goes only “halfway.” I’m a firm believer that if you are going to do something- do it all the way, and do it right. If this show was only dark sometimes, and light-hearted and funny at others, I don’t think it would be nearly as successful. 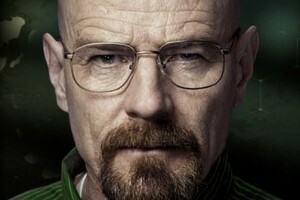 By creating a concept and staying consistent Breaking Bad has become a hit series. Just as Gilligan chose a cast based on experience and past relationships, marketing agencies must create a well-rounded team. After watching the show for the past four seasons, I can’t see anyone else but Bryan Cranston for the main role. Your team should be exactly the same. Each member should be excellent at their specialty, and a vital member of the company. Donna Nelson is a professor of organic chemistry at the University of Oklahoma. Scriptwriters for the show have used her as an expert resource to ensure scientific accuracy. Because they know their limitations, the writers have wisely reached out to sources who do. No one expects a single person to know everything about everything – that’s impossible. By recognizing areas where we fall short and asking for help, we can provide precise information and excellent, trustworthy content. So how does that relate to your business? Let me ask you this: did you go to school for or have vast experience in marketing? Design? Social Media Management? If not, why pretend? Do yourself a favor and find an expert to help you. If you watch the show, you know all about how Walter has quickly spun out of control over the past four seasons. Each decision he makes builds toward a consequence. In the second season, we even find out that he is inadvertently responsible for a devastating plane crash. While perhaps not nearly as devastating, every marketing decision made has a consequence. Some of these consequences are good, others are not so great. Even the decision to do nothing has a consequence. However, by understanding your options and making informed decisions from the beginning you can create a very successful marketing campaign. One of my favorite characters on the show is Saul Goodman, played by Bob Odenkirk. Saul is Walter’s sleezy lawyer who eventually helps him embezzle millions of dollars at a car wash. Saul brings a bit of comic relief to the show, with his somewhat harebrained schemes and overall slimy nature. Saul consistently asks for more and more money from Walt, despite the lack of ethics or morality of his services. When choosing a marketing agency, be careful of the “Sauls” who promise you improved rankings for keywords or page results. An experienced marketer will explain that there are no shortcuts in SEO, and that long-term goals are more realistic than short-term results. Using “Saul-like” marketing agencies will only end up getting you into more trouble down the road. I hope now that you’ve read this post, you find that I’m not just a television-loving designer, but that you can also see the marketing lessons that I’ve learned from Breaking Bad. My intention is for you to understand that it doesn’t take a big budget to create something truly great. Instead, your marketing toolbox should consist of a great team, creativity, a consistent message and purpose, and a little bit of risk. Are you looking for effective, creative marketing with long-term goals in mind? Contact Optimum7 today for a free consultation.